The next in our series of head-to-head battles pits the two most recent models of the F4F Wildcat, the 22-year-old Hasegawa kit versus last year’s Airfix kit. The Hasegawa kit is one of my favorites, and I’ve built it a couple of times; when it was released in 1994, it was a revelation and a massive step forward from what was available (the grotesque Frog/Academy kit and the not-really-an-F4F Airfix kit). So, you might think, there could be a bias for the Hasegawa kit. But that model had holes in its game: the wheel well was lacking, the cockpit needed a little work, and there were a few minor accuracy issues that held it back. Price also sets an undertone for this bout. The Airfix kit can be had for prices under $10, while the Hasegawa kit has… a Hasegawa price tag. Could it be that one entry is both better as a model and as a bargain? We shall see! So, with that said let’s meet our contenders! In this corner, the defending champion as the premier 1:72 F4F, ironically hailing from Japan, is Hasegawa’s family of F4Fs (I’m using the FM-1 boxing, just for full disclosure)! And in this corner, the challenger, all the way from England, it’s the Airfix F4F-4! The ground rules: this match will be decided using the 10-point must system, where the winner of each round earns 10 points and the loser 9, except in cases of knockdowns. Any show-stopper problems will count as a knockout and cause the judge to dump his examples of the losing kit at bargain-basement prices at the next contest. There will be no hitting below the seat belt (F4Fs didn’t gain shoulder harnesses until October 1942), the use of extraneous drop tanks will be noted, and any snarky comments about the Marines will earn a one-point deduction. Now let’s meet our judge! He has three Wildcats in his collection (a Frog F4F-3 conversion, a Hasegawa F4F-4 and a Sword FM-2) and knows more about the Wildcat than he really wants to. The man who mastered the installation of the belly window (after much trail and error) … me! Bot companies give us sturdy, top-opening boxes, so the parts will be well protected (both in the hobby shop and in the inevitable years in the stash). Hasegawa’s had a nice selection of art by Shigeo Koike; the FM-1 has a painting of a Wildcat dipping low over a surfaced U-boat. These eras of Hasegawa kits had the cover painting across the entirety of the box top, and this edition (unlike some) has a photo of a built model as well. Airfix has its current red border partially surrounding a painting of Marion Carl’s F4F-4 dispatching a Zero; it’s a nice painting, but the background atoll is nothing like Guadalcanal. Carl flew at Midway, but in an F4F-3 with different markings (and his opponents did not yet wear green camouflage). The Airfix box has some CAD images and, thoughtfully, profiles of both decal options (something Hasegawa usually fails to provide) Aside from the Airfix geographical issues, there’s not much difference here, so we declare round one a draw. Panel lines in the Airfix kit are heavier than in the Hasegawa kit, but the Airfix really suffers in including surface detail that’s not present in real life. The Airfix kit has the fuselage access hatch on the starboard side as a significantly raised feature (it was flush with the fuselage) and the upper wings feature slightly raised ammunition tray doors. These are truly weird inclusions. It gets worse when you look at the control surfaces. Hasegawa has faintly-suggested ribs in these fabric-covered areas; Airfix gives you separate and positionable ailerons and rudder, but these areas and the elevators look pretty saggy. This round is a clear win for Hasegawa – in fact, the cumulative shortcomings of Airfix’s surface detail make this a 10-8 round. The two models match up almost exactly to each other in terms of dimensions, and these match published dimensions. One detail leapt out at me at first look: the oil coolers. Airfix’s oil cooler fairings are notably teardrop-shaped; this is very much unlike the originals, which are longer and less wide at their fattest point. Hasegawa gets this detail far better and ekes out a win in this round. 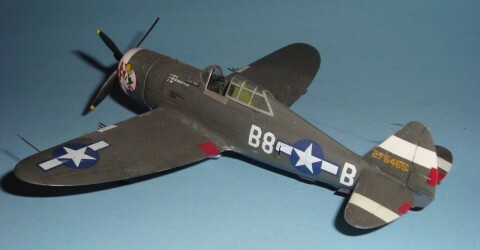 Both kits let modelers down by supplying only the tailwheel used by land-based aircraft. Some enterprising resin company should undertake a resin replacement so we could build some accurate pre-January 1943 carrier aircraft. The wheels themselves are something of a wash: Hasegawa’s have refined hubs but have three fasteners on the hub instead of six, while Airfix has six but they are ridiculously oversized. Hasegawa’s wheels have knockout pins on the backsides that make them virtually unusable; Airfix has their wheels covered in busy detail that in no way resembles the real aircraft. Airfix almost loses the round, but rallies with a six-part set of main gear struts (Hasegawa’s gear has three), a very nice aft wheel bay bulkhead complete with chain gear and, most importantly, the rear wheel-shaped internal fairing totally omitted by Hasegawa. Sadly, the inner gear doors have enormous ejector pin marks an issue they share in common with the Hasegawa kit. Airfix takes this round 10-9. Hasegawa does itself no favors with its standard sparse cockpit, with a seat, a control column and a solid-floored cockpit tub that is not only inaccurate but is festooned with four ejector pin marks. The head cushion is split between the fuselage halves. Airfix, on the other hand, goes all in, with a seat (also without belts), a instrument panel on an accurate bulkhead, a nice rear bulkhead that includes the headrest, and a detailed cockpit tub… that, like the Hasegawa example, is also inaccurate. Details are provided as decals. This was a chance for Airfix to score big, and while it wins this round, it missed out on a big chance gain two points here. In this round, Airfix hurts its cause by working too hard. Its R-1830 has pushrods and wiring harness detail superimposed over some nice (though hard to see) cylinders, as opposed to Hasegawa’s simplified rendering. This attaches to a backing set of cylinders that seems a bit soft. Hasegawa’s front bank of cylinders attaches in a similar way to a rear bank. But here’s where Hasegawa is marginally better: it includes the magneto and the distributor housings, although they’re somewhat simplified. Airfix only has the distributor housings, and they look rather odd, as if they’ve somehow melted back into the cylinders. Hasegawa is slightly better, but the only real solution is a decent aftermarket engine, especially since the back of the engine is visible through the wheel well and neither kit gives you any of this detail. This round is a draw. Airfix’s hub is miles ahead of the goofed-up prop hub in the Hasegawa kit, but the tips of the blades are far too blunt. How do you score this round? Airfix wins – with a bit of sanding and re-shaping. Airfix learned from Hasegawa’s error to take this round. Hasegawa provided single combination windscreen and sliding canopy; Airfix’s parts were a little thicker and cloudier, but you get your option of a single windscreen/canopy and separate pieces, including a sliding section that’s sized to fit over the spine in the open position. No contest – Airfix takes this one. Do you like simple, or do your like complete? Hasegawa sums up its entire build in a six-step process, with drawings absent of any description. Airfix goes bonkers with a 46-step, seven-page instruction process, with separate drawings for optional features. Airfix takes it. This is not a consideration with most aircraft, but the Wildcat had many variations and it would be easy to mess this up. Hasegawa’s cowling ring captures the slight forward flare of the intake at the top front of the cowling; Airfix captures this too. Airfix’s full cowling includes the intakes inside the cowling as molded-in parts of their single-piece cowling; Hasegawa provides intakes as separate pieces that the modeler adds. The big difference is that Airfix includes the cowl flaps in the open position, which is a nice touch but which will again expose the limited detail on the back of the engine. Slight win for Hasegawa. Hasegawa operates at a disadvantage here; their decals almost always feature a slightly creamy white color that lets all their kit sheets down. The FM-1 kit used here had two schemes, one for VC-12 in the Atlantic and the other for VC-33 in the Pacific; small details, like the VC-12 logo with a black cat flipping the bird, were very well rendered. The Airfix decals are neatly printed – and the white is white. Markings include one of the few F4F-4s with the red/white rudder stripes and stars in discs with a red meatball at the center and Marion Carl’s Guadalcanal F4F-4, with a full 19-victory scoreboard. Airfix also includes prop decals, some data decals and wing walks. Round to Airfix! Airfix’s kit is notable for its option of folded wings. Better yet, the kit also provides full extended wings, so if you want your wings extended you don’t have to glue and fill folded wings in the extended position. It also includes the jury struts. The wing fold internal detail is OK, but would benefit from a little extra detail. The Hasegawa external tanks are better – again, Airfix’s are a bit too teardrop-like and the rears aren’t pointy enough – but even still, in this round it’s Airfix, all the way. So, according to the judge’s scorecard, the winner and new best bet for a 1:72 Wildcat, is Airfix’s F4F-F by a score of 116-113. Closer than you might expect, yes, and the win brings with it some caveats. One, the raised ammunition trays and fuselage access panel need to be sanded down. They stand far too proud and are silly mistakes on Airfix’s part. Two, get an aftermarket engine. Three, find some substitute for the cockpit floor – it’s simply not accurate out of the box. Four, maybe find some replacement main wheels (Obscureco’s would work well, he said self-servingly). Five, do a little work on the fabric-covered surfaces – the detail is simply too heavy. The good news: there’s a new F4F at the top of the heap. The bad news: it still takes work to build a world-class Wildcat.